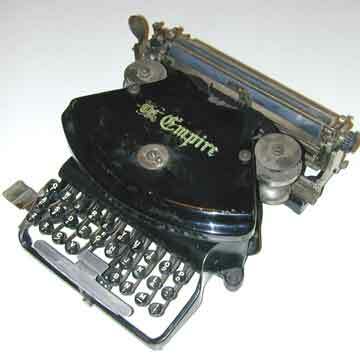 The Empire, aka the Wellington, was the first in line of a highly successfull range of thrust-action typewriters based on the original design by Wellington Parker Kidder. The machine was introduced in the US (Wellington) and Canada (Empire). Picture six shows how the type in the machine is spead out in a fan shape with the type facing forward. On pressing a key, the type bar slides forward and hits the platen. It is a relatively simple but highly efficient process that would survive for many decades. The logo of the first Empire as it was introduced in Germany. The Empire brand expanded and the machine was changed and improved. The machine was also built under Canadian license by the Heinrich Meyer company in Germany, originally under the Empire brand, but soon after minor changes were made and the machine was marketed in Germany as the Adler 7. The Adler 7 next to the original Empire. The Empire disappeared, but Adler went on to to produce thrust action machines that remained in use all over Europe until well into the 1960s. For an example of one of the later Adler models, see the Adler 15 that was introduced in 1909. For more information see the special feature on thrust action typewriters in the book â€œTypewriterâ€�, page 140.